The Q7 is no longer Audi’s flagship SUV, but it still is an important product in its portfolio. It is due for an update and now a new set of spy images revealing its interiors have surfaced on the internet. Latest spy shots suggest subtle changes to its design too. Also, it can now be confirmed that the Audi Q7 facelift will be equipped with the same three-screen dashboard layout as the new Q8. 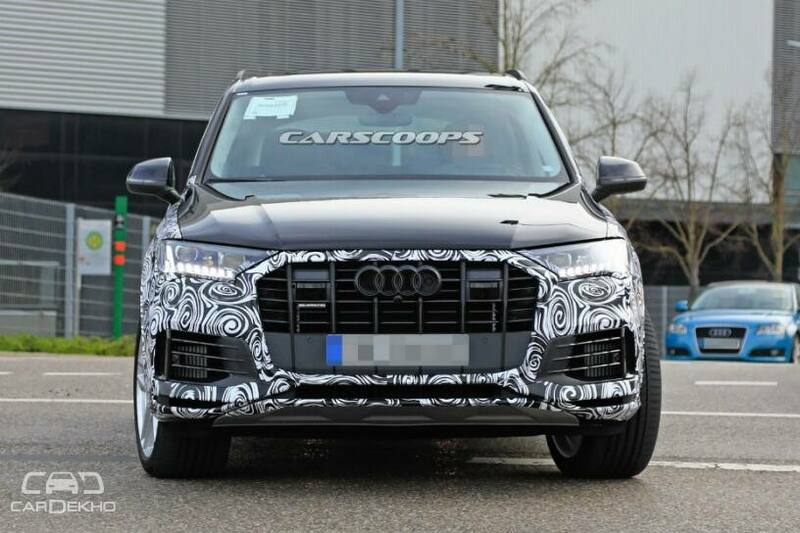 There have been multiple sightings of the upcoming Q7 facelift’s camouflaged exterior, but this is the first glimpse at the cockpit. From the spy images, we can identify that the dashboard clearly sports three screens. Starting from the driver, the first is the 12.3-inch virtual cockpit display. Then there is the 10.1-inch MMI touchscreen display for vehicle settings and infotainment in the centre, and finally an 8.6-inch screen below it for seat and climate controls. The facelifted Audi Q7 should be unveiled in the second half of 2019 with production expected to begin in 2020. The tech and safety updates to the luxurious 7-seater SUV will make its case stronger against the new Mercedes-Benz GLE and BMW X5. Expect the updated Q7 to come to India sometime in 2020. With the current Q7 prices starting from Rs 73.73 lakh (ex-showroom, Delhi), we expect the new Q7 to be priced at around Rs 80 lakh ex-showroom.